Georgia and Nick’s previous home had a European-style IKEA kitchen and they were very satisfied with the quality of the cabinets. When they bought their new home they saw nothing but potential for another great modern IKEA kitchen. The biggest need for Georgia was having a functional kitchen. She wanted space for her kids to run around, and for stuff to be close by and easy to get to. So all of her base cabinets have IKEA’s MAXIMERA drawers in them. She also chose the VOXTORP doors in white because of their integrated handles. Georgia found Inspired Kitchen Design when she was Googling the cabinet fronts she wanted. IKD had recently posted an article about them, including how the upper corner cabinets do not work in this series. The cabinets in the picture above have horizontal doors. We stacked them two by two. In fact, Georgia keeps her “very heavy” plates and bowls in them, but the cabinets can take the weight easily. Another feature of this modern IKEA kitchen is the tall pantry cabinet that has electrical outlets inside. IKD doesn’t design lighting or electrical because of how electrical codes vary across the United States, Canada, and Europe. But Georgia included them and we think that’s a great design tip for you: because of the outlets, she can keep her coffee maker in there which makes the kitchen look much neater. Very European style of her. Georgia also chose to keep the sink out of the island. Why? In her previous home, the island had held the sink, and she found if more than one of her 3 small children were helping on the island they would always be complaining they were falling off the edge or falling in the sink! Now she has more work surface area and less complaining from the kids. A good tip for IKD customers with small children. The oven range, refrigerator, and dishwasher are all Thermador appliances from Speciality Appliances in Denver. Georgia liked the matte stainless steel because sticky little fingerprints don’t show up. Fingerprints also don’t show (very much) on the VOXTORP doors. Their previous home had high-gloss white doors (now called RINGHULT) and they showed every fingerprint and stain when the sun would hit them. The sink is from Home Depot and the faucet is a Kohler. But, the quartz countertops are from IKEA in pure white. Remember that mint green backsplash? We love how Georgia carried that theme into the stools and chairs and she claims they are very comfortable. Two other product notes: those are RANARP pendant lights over the island, and the sink pendant lights are from Amazon.com. 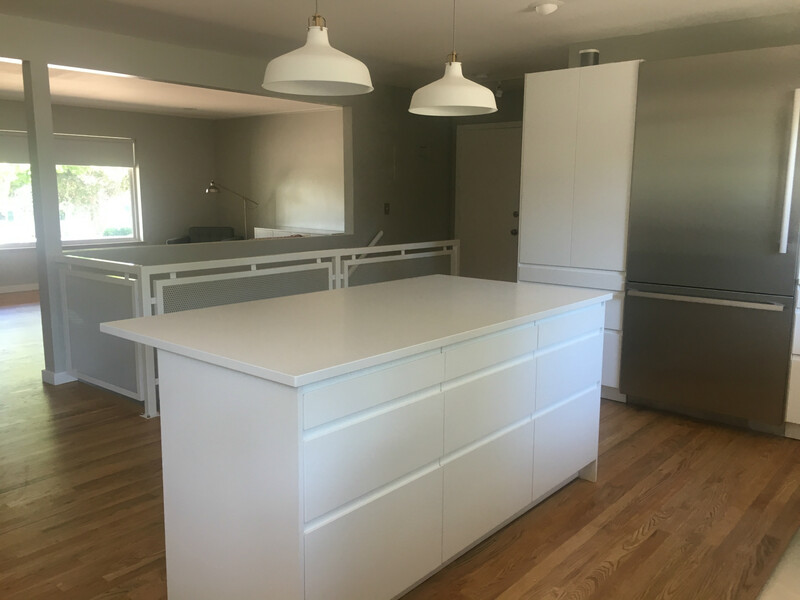 Georgia and her husband want to give a shout-out to IKD for their IKEA kitchen design, and Kimball Cabinet Installation for doing such a great job on their kitchen installation. IKD was great. They were so fast to respond. They started our design 2 days before the sale and we finished in time to shop for the sale. Is it time for you to take your kitchen cabinets from the Stone Age to the Future Age? 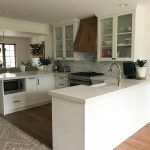 Whether you want a modern white IKEA kitchen like Georgia’s, or a more classic, farmhouse, or Mid Century Modern kitchen, IKD can design it for you. Find out how we work with our customers (is that you?) to get you the kitchen of your dreams.